Delight family, outdoor enthusiasts or hunters with NESCO Jerky Seasoning Variety Pack that makes up to 26 lbs. of meat. 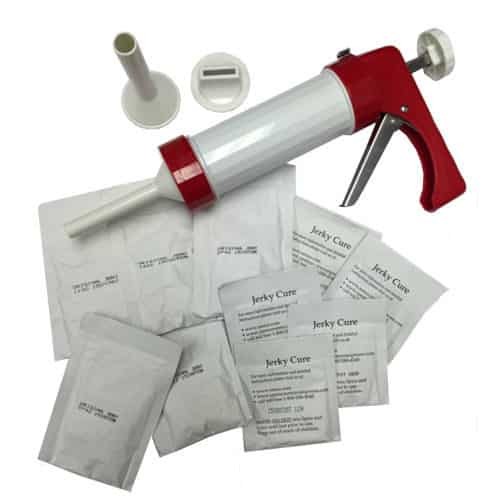 13 seasoning packs and 13 packs of cure are included to make fresh homemade jerky from lean ground or sliced beef, pork, turkey, or other meat. To use, simply mix the spice and cure packs with lean ground meat or add a ½ cup of water to the spice and cure when making sliced jerky. Use a jerky gun to make sticks or place slices onto a NESCO dehydrator or in a conventional oven for a great-tasting snack. Jerky will be ready in a matter of hours and at a fraction of the cost of store-bought. Tuck a few bags of jerky into a school backpack or camping gear for a thoughtful and tasty treat perfect for any student or sportsman. NESCO Jerky Seasoning Variety Pack is gluten free and made in the USA.